Local craftsman Terry Danielson created a unique, custom made wooden jewelry box for his daughter-in-law. 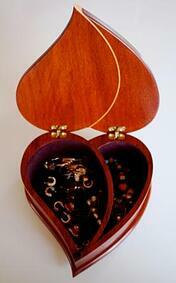 The beautiful handcrafted hardwood jewelry box is a work of art. Handmade from Paduak hardwood with a maple inlay, the craftsmanship in Terry’s work is evident. 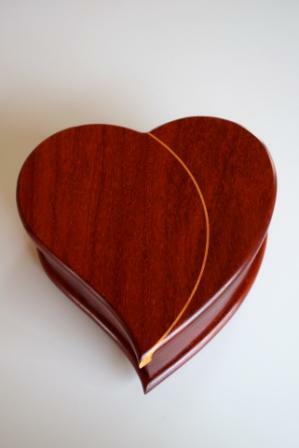 The heart shaped design was cut from a piece of Paduak hardwood, an exotic hardwood species from Africa that has good strength and a rich interlocking grain pattern. Paduak is a gorgeous orangey brown color that will darken to browner tones naturally as it ages. properly into the design, Terry meticulously sanded both the maple and the Paduak for a perfect fit of the two wood species. Terry used multiple coats of Water-Lok to finish his hardwood project to a beautiful luster. Paduak hardwood is a great wood species to consider for a number of different custom woodworking projects.